Well I hope you if you're reading this review you had as much fun with this show as I did! It wasn't exactly what I expected going in and while I don't think it's going to go win any Emmy's or anything I still enjoyed myself. It definitely took some turns I wasn't anticipating and I found the cast extremely likable. Light as a Feather is a series about a group of girls who get roped into playing the titular game with a mysterious new girl named Violet. The game quickly spirals out of control when Violet starts predicting their deaths and those visions come to fruition in real life, killing two of the girls across the season. The mystery of the game and of Violet unravels over the course of ten episodes which I've broken down into the major components in my review. The story begins with a tight-knit group of girls: Olivia (Peyton List), McKenna (Liana Liberato), Alex (Brianne Tju), and Candace (Ajiona Alexus), ushering in the Halloween season by going to a graveyard (as all teen girls do right - seriously whatever happened to hunkering down under some blankets and binging on candy while rewatching Hocus Pocus?) to play the infamous game of Light as a Feather. They invite the new girl, Violet (Haley Ramm) after a prank on Olivia's boyfriend goes terribly awry and Violet ends up at the receiving end of her very own Carrie scene on her first day. They figure the least they can do is extend an olive branch in the form of a night out. Though with the way things turn out... they would have been better off sending her some chocolates and moving on. Regardless, the girls take a detour to a graveyard and play the game. It actually ends up being Violet's idea, alarm bells anyone? I remember when I played Light as a Feather it didn't involve anything about predicting death. But in this version of the game, the ultimate purpose is getting a timestamp on your life. Violet proceeds to predict how each member of the group will die and all of them are horribly violent deaths: choking, drowning, car crash, you name it. The only death she isn't able to predict is McKenna's. The first death of the series doesn't hit until the end of the second episode and after a few false leads. I didn't think Olivia would actually end up dying as the show gives us a couple of fake-out moments. When she ultimately does die, exactly the way Violet predicted, Trey (Jordan Rodrigues) is the one behind the wheel. Not what I expected! My first thought was, "this is definitely going to further complicate the strange frenemy relationship he has with McKenna." Afterwards, the deaths are surprisingly sparse. The only other main character that dies is Candace and it's not until the final stretch of episodes. Also Henry mysteriously disappears but more on that later. Despite there not actually being many character deaths on the show, the premise of those deaths is still very present. All of the girls are haunted by the possibility of death lurking around every corner. Although the biggest mysteries surround Violet, whose death we know nothing about and it serves as a plot point, especially towards the end, and McKenna, whose death Violet was not able to finish predicting. McKenna's strange hallucinations, Violet trying to predict McKenna's death while she's asleep, the weird growth on Violet's back that has me trying to call Ripley from Alien for back-up, poor Isaac falling into her strange succubus tendencies and having the life sucked out of him, though given his cheating and his complete lack of care towards Candace I can't say I was too choked up about it. For anyone whose a fan of horror I don't think you'll find the show all that scary, maybe a few chills here and there but there are some gross-out moments, creepy bugs, ghoulish shadows, and scary deaths, obviously. The love triangle was the weakest part of the show for me. It ultimately didn't affect much of the plot and merely served to add a little bit of teen angst into the mix but it was light on even that. There wasn't much conflict involved. McKenna started out liking Henry (Dylan Sprayberry) and having a strange, complicated relationship with Trey, which turns out to be due to him struggling with his feelings for her? I think? It's a little unclear. Regardless, McKenna decides Trey is the one she wants to be with and at the end of the season they're seemingly in a relationship. Jenny was McKenna's twin sister. We don't know what happened to Jenny in the beginning, her story is revealed bit by bit over the ten episodes although Alex's involvement is hinted at pretty early on. We find out that Jenny died of an overdose with drugs supplied by Alex. Violet eventually puts two and two together to figure this out and then uses that piece of leverage in order to blackmail Alex, as McKenna doesn't know and were she to find out she might never look at Alex the same way again. To McKenna's credit, when Alex eventually comes clean she does forgive her. Jenny winds up playing a bigger role at the end of the season. Through a series of flashbacks in the ninth episode, we learn about the curse of light as a feather. Violet was given the curse from another girl whom she played the game with before. In the past, light as a feather lead to the death of her then-boyfriend and other friends, Violet was the lone survivor and therefore the curse passed on to her and if she wants to survive she has to pass it on to someone else. We also learn that you cannot die in a way other than how your death was predicted. Alex attempts to kill Violet at one point through electrocution in the bathtub but she comes back to life because it is not the way she was predicted to die. Thus explaining why Violet is so hellbent on discovering what Mckenna's death vision is so she can ensure it is fulfilled and break the curse that is rotting her body from the inside. I felt like the ending was a little too abrupt for my taste and therefore somewhat anti-climatic. I wish the story had moved a long quicker so the last few episodes wouldn't have felt so rushed. McKenna, Alex, and Violet go to the morgue to play one final round of light as a feather, this way they can have the presence of Candace and Olivia there to maintain the illusion of five people playing the game since that is a requirement. Violet is finally able to predict McKenna's death, sort of. Whilst McKenna is in the center, her soul leaves her and goes to another realm where she finds her sister, Jenny, waiting for her. In Violet's voiceover she claims this is McKenna's death, being stuck in this otherworldly realm because she doesn't want to leave Jenny behind and lose her again. To save her sister, Jenny seemingly takes the curse away and unto herself, therefore breaking it and allowing McKenna to go back to the world of the living where Violet has knocked Alex out and put McKenna into a body bag before fleeing. Luckily, Trey and McKenna's mom get there in time to save both girls just as Violet gets rounded up by the police - and discovers she no longer has the growth on her back, meaning the curse is really lifted for her. Five weeks later, all is well for the remainder of the group, Trey, McKenna, and Alex. As well as it can be anyways, given the death of Candace and Olivia, and the disappearance of Henry. And just when you think it's all over, McKenna gives Alex and Trey the slip to have a clandestine meeting with Violet in prison to try and get answers from her about Henry's whereabouts and her death prediction, which we still don't know. We're left with the image of McKenna walking away and the dawning realization that she now carries that strange alien growth on her back - meaning the curse is alive and thriving and "McKenna" is the one afflicted now. I put McKenna in air quotes because I felt it was implied that Jenny was the one that came back from the purgatorial realm McKenna was sent to. It would make sense given the last moment where we see the curse is now on her body and we were lead to believe that Jenny had taken the curse from McKenna, perhaps Jenny performed some kind of body swap? McKenna did seem different in her attitude in the last moment too, she was more snarky than usual. Despite feeling like the ending was rushed, I still liked how everything turned out. I enjoy endings that leave you theorizing. Plus, it left plenty of room for a second season and I hope the show manages to score one. 1. What happened to Henry? It sounded like birds were coming after him in those final seconds before he vanished. 2. What exactly was that thing on Violet's back and then McKenna/Jenny's at the end? I understand it's how the curse manifests but Violet said it was rotting her from the inside, what would have happened had it taken over I wonder. Would she have morphed into a creature of some kind? Is that what the butterflies that kept popping up everywhere meant? 3. What is Violet's death prediction? 4. Who was it that visited Violet in prison: Jenny or McKenna? 5. Will we get a season 2? I hope so! After learning Zoe Aarsen's book actually spans across a trilogy and after seeing how the finale was setup I have to assume they're leaving it with so many questions to be answered in a follow-up season. 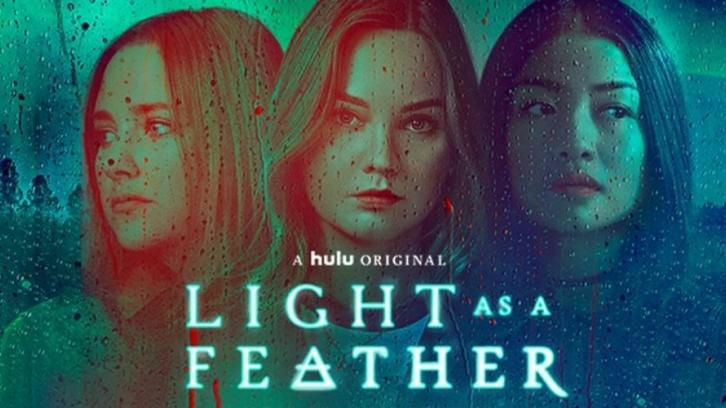 ALL EPISODES OF LIGHT AS A FEATHER ARE STREAMING NOW EXCLUSIVELY ON HULU!